The VERA project provides relevant strategic intelligence for the future governance and priority-setting of the research, technology, development and innovation (RTDI) system in the EU and for better adapting science, technology and inno-vation policy to the shifting global environment and upcoming socio-economic challenges. For this purpose VERA carries out an in-depth stocktaking of RTDI related forward looking activities in Europe and internationally and a thorough review of trends and drivers of long-term change of European RTDI governance. On the base of these insights VERA develops scenarios on the evolution of the European Research Area, assesses the critical issues for the ERA’s future capabilities emerging from these scenarios, explores subsequent strategic options and ultimately generates a set of policy recommendations for responsive and future oriented multi-level, multi-domain RTDI policy strategies. As VERA will run until 2014 we will present some intermediary results of the first two work packages in this Brief. Recently, ERA has undergone many relevant changes from inside. First of all, research and development became a domain of shared competence between the member states and the EU as a result of the new Lisbon Treaty in 2009. The subsequent strategic processes, such as the Lund Declaration, the Ljubljana Process, the Europe2020 Strategy and the Europe 2020 Flagship Initiative Innovation Union, have provided a solid mandate for a strong and open European Research Area that is highly responsive to societal challenges and provides excellent research and innovation activities in open exchange with the international RTI landscape. However, in order to realise this ambitious agenda, the share of integrated research expenditure needs to be significantly increased. Furthermore, new coordination mechanisms are required to allow for flexible identification of ERA priorities, mobilisation of the critical mass of funding, and governance of its implementation. Thus a number of opportunities and experiences for more integration and pre-allocating significant chunks of EU funding to joint priorities do exist. At the same time, there are many tensions associated with the implementation of these strategies. A key challenge and opportunity for ERA development is its relation to and integration with the wider world. The production and composition of knowledge have become globalised. While science always has been international, the scope of actors and the need for coordination and cooperation across the globe has changed dramatically in the face of global challenges. At the same time, there is an increasing specialisation of knowledge production and exploitation. Global division of labour and connecting the global centres of excellence that have emerged is a key requirement of the future. In addition, many of the problems European societies face are either the same as for other societies (obesity, demographic change) or transnational in nature (climate change, pollution, security) while the EU is just one among many international players. The overarching challenge of decoupling economic growth from the depletion of the ecosphere and preserving natural capital demands an unprecedented alignment of efforts on a global scale. There are a number of changes in the way research and innovation is being embedded in the societal context. Changing values and lifestyles are giving rise to new societal expectations of research and innovation. Changing economic and institutional contexts introduce new rationales into knowledge production. Established boundaries, such as basic and applied research or users and producers of innovation and knowledge, are blurring. New actors such as NGOs, citizens and user groups are increasingly playing relevant roles in the realm of research and innovation. The need for research and innovation to address the grand challenges in realms such as health, food, security and sustainability is not only increasingly advocated but also poses new kinds of challenges. Transformative socio-technical pathways rather than isolated key technologies need to be explored. Social innovation, service organisation and organisational innovation need to be aligned with breakthrough technological innovation. Experimental approaches are gaining relevance for successful innovation trajectories, in particular when transitions are at stake. These changes make it imperative to situate ERA in the global context. In order to generate custom-made strategic intelligence for the future of ERA, the starting point was, first, to identify Grand Challenges (GC) and, secondly, to do so in relation to research sectors that are relevant to the ERA. The GC were identified based on existing EU documents and discussion papers that had been published in the context of pertinent foresight and horizon scanning projects. These GC were classified into relevant research sectors, for instance health, energy, environment and civil society. This approach allowed a thematic clustering of topics, which then served as a basis for broadening the scanning of FLAs. Ten sectors and more than 760 GC in total from a stock of 71 sources were identified. What Grand Challenges in the fields of economy, environment, geopolitics, society and ethics, technology and health are the documents and projects under consideration concerned with? Do these documents and projects represent the discourse on Grand Challenges in the European Union and in other parts of the world? What conclusions can we draw from these documents concerning the future governance needs of the ERA? And what do they tell us about the future requirements of RTI governance? Increasing polarisation and regionalisation are driving towards a multipolar world. Possible evolutions and implications of or even solutions for this multi-aspect and multi-level challenge are still hardly understood. Attitudes and values are changing globally; societies and particularly policy need to respond to these changes. A number of developments require new models of governance that go beyond the traditional model of the state. The more the world becomes interconnected and interdependent, the more new forms of crime and security threats are interlinked and have far-reaching consequences at all levels of society. The ageing of populations has diverse implications for science, technology, economy and society that are proliferated in the context of new health risks and ineffective health systems. In the financial sector the risk of systemic failures is increasing. A growing unease with the current model of economic growth calls for alternative approaches to societal progress at the macro level. At the same time, environmentally sustainable business models are required in all sectors of economic activity. The challenge of migration takes many forms as a consequence of other challenges such as climate change, food and water shortages, natural disasters, pandemics etc., each of which requires a specialised and coordinated response at various levels of governance. The education and training systems in Europe need to be modernised. A more specific demand defines the need for education systems capable of promoting sustainability, innovation and solidarity values, and new professions require highly skilled craftsmanship. Impoverished regions around the world are struggling with acute and virulent health issues. New health problems are arising globally due to climate change. Without ecologically, economically and politically sustainable solutions, scarcities of basic resources may lead to extensive and serious social and political problems in some areas of the globe. Demand for metals and minerals is growing dramatically, especially due to the fast growth of emerging economies and increasing strategic demand for minerals in industrialised economies. Adopting sustainable forms of energy production and consumption is one of the key means for mitigating climate change. Environmental and health impacts from emissions, mitigation of climate change, urbanisation, the need for traffic safety and security, and avoidance of traffic jams are among the drivers pushing towards the reinvention of mobility and full-scale transition of existing transportation systems. The fragmentation of Europe, poor education and skills as well as rising costs and declining labour force participation caused by demographic change may prevent effective exploitation of Europe’s research and innovation potential. From the analysis of a broad range of sources on Grand Challenges, it becomes clear that we cannot take a European perspective only. Especially not when attempting to identify ways of dealing with the Grand Challenges, or at least some of them. The most pressing challenges are globally interconnected and require global action. Topics like Our modes of energy supply (14), Providing basic resources for increasing global demands (12) and The world becoming more interconnected (4) are the ones most frequently discussed. They also show the need to accept shared responsibility on a global scale, which implies that the EU countries cannot lay back and point to other countries to take action. On the contrary, from a European perspective, European countries are among the major contributors to the drivers of the Grand Challenges and among the major countries affected as well, although the impacts of the Grand Challenges are more widespread globally than the drivers are. The sixteen clusters identified and discussed above also seem to be the ones that call for policy action most immediately and represent the cases where such action could make a substantial difference if planned and executed in a systemic way. To face the Grand Challenges to the future of Europe, most of all we need to cope with the global ones. If we make a major contribution to the global ones, we will be better equipped to cope with the challenges that lie ahead for Europe. What we as Europeans have to face is that our lifestyle and the underlying economic model must be considered the root of fundamental problems with devastating global consequences. Many studies and independent resources have pointed this out before. It is of course not only the European lifestyle but also that of all developed economies. At the same time, the global interconnectedness that seems to make this lifestyle transferable to emerging, lagging and, in the long term, even to undeveloped economies also makes societies vulnerable to shocks in many respects. Facing the Grand Challenges means to introduce fundamental changes in many areas of our lives and activities, thereby affecting global liaisons as well. Even if radical changes are unrealistic, the changes required in tackling the Grand Challenges will be felt by every European citizen. Policy-makers are in a crucial role as these changes will not occur without fundamental and coordinated policy measures in almost every policy area. Furthermore, it becomes clear that the scope of these Grand Challenges is in essence societal. We need to take this into account when we talk about policy action, for example in the area of research, technology and innovation policy – in the respective work packages of the VERA project and beyond. We especially need to consider what the impact of that societal scope is with regard to the systemic character of handling the Grand Challenges. The second set of tasks performed was to synthesise the existing insights on trends, drivers and key dimensions of change in European RTDI governance. A computer-assisted analysis helped to characterise the body of discourse on ERA in a systematic and quantitative manner. The analysis of text data on ERA was expected to allow interpretations and descriptions of the attitudes, structures, values and norms that currently dominate STI governance. In view of the large quantities of data in textual form, text analysis provided an important means of discovering obscured meanings and unveiling hidden relationships. The computer-assisted analysis took as a point of reference a pre-understanding of ERA constituencies gained through literature review. Following the digitisation of the entire corpus, linguistic analysis software was used for cleaning and formatting, unitising and indexing. The development of categories and dictionaries, as well meaningful associations, relied on qualitative analysis techniques. Quantitative text-analysis software allowed to produce an aggregation of unit-level coding. Statistical and network analysis software was used to highlight frequencies, trends, comparisons, networks and maps of relevant factors influencing STI governance. Subsequent interviews with ERA “thinkers” served to obtain additional types of information (i.e. narratives, accounts, fronts, stories and myths). Relevant factors identified by means of discourse and interview analysis provided the basis for a so-called key-factor workshop with key stakeholders. The insights on potential key factors were synthesised into a background document. Based on these insights, VERA developed scenarios on the evolution of the European Research Area. VERA’s uniqueness is grounded in the systematic knowledge base it creates, for example, by stocktaking exercises such as the one on Grand Challenges described above. They are publicly accessible and intended to be used widely. At the same time, the results of these exercises feed the scenario process, the subsequent assessment of the scenarios, and the exploration of strategic options. Another distinct feature of VERA is that it pays particular attention to the assessment and policy implications of the scenarios, which will help to make scenario results useful for policy-making and thinking about the future of ERA. Many of society’s most pressing problems are long-term policy challenges, lasting a generation or more. Policymakers and business leaders often face strategic decisions with uncertain future outcomes. Despite numerous unpredictable factors, decision-makers need to be confident that they can achieve specific outcomes. Failing to do so could result in systemic failures with major consequences for society. The European Environment Agency (EEA) undertook analyses through the BLOSSOM project (Bridging long-term scenario and strategy analysis: organisation and methods) to identify a ‘toolbox’ of approaches to institutionalise long-term futures thinking in government; to explore which countries have introduced respective approaches and tools, and to identify the pioneers as well as which methods have become commonplace and which have not; to look for commonalities and differences and identify the factors that can explain the success or failure of efforts to embed a long-term perspective in policymaking. Why Bring Foresight to Environmental Policymaking? While academic literature has thoroughly assessed the pros and cons of different methodological approaches, systematic analysis of the use, impacts and effectiveness in environmental policymaking is still superficial or absent. It is evident that the institutional and governance aspects of foresight work need to be given more attention. We also need new structures that break with single forecast models, which miss the complexity and uncertainty in future developments, and different institutional arrangements to implement them. For future studies to gain greater relevance in policymaking, there are also two science-policy challenges that have to be tackled: policymakers often perceive future studies to be evidence-based and the time scale of future studies differs from that of policymaking. The characteristics of the problem-solving context make it very hard to introduce the long-term perspective needed to analyse environmental problems. However, futures thinking and foresight is increasingly being used to inform policy, through the use of techniques such as expert panels, workshops and scenario planning. Explorative or normative scenarios are often used for long-term futures thinking whereas for more short-term purposes predictive techniques such as forecasts and outlooks are more common. The analyses proceeded in two stages. In the first stage in 2008, the EEA started to analyse the success factors and barriers to a long-term perspective in public policymaking with particular reference to environmental planning. The EEA report Looking Back on Looking Forward (EEA, 2009) — a precursor to this study — reviewed the available evaluative scenario literature. The research found that only a few studies evaluated the actual impact of scenarios. Most of those studies found that scenarios were indeed useful in preparing corporate strategies and public policy, although most focused on the business sector. Moreover, the public sector presented several difficulties, including the varied set of goals and interests that public agencies face. The research concluded that more empirical evidence is needed particularly on what types of scenarios work in different contexts and the institutional arrangements that enable scenarios to be used more effectively in order to demonstrate that scenarios can deliver on their promises. studies were included following the same approach. The project involved consultations on draft case study country reports and the comparative analysis report with the interviewees and other stakeholders in all the countries studied. In the later stage, additional consultations took place with the EIONET network of experts. Upon completion of the case studies, the crosscutting report analysed the key findings and presented a crosscountry comparison (available at http://www.eea.europa.eu/publications/blossom/). The research did not seek to evaluate the quality of individual futures studies or to explore the whole range of futures work (such as research or technology foresight). It only addressed the aspects most relevant to environmental policymaking, notably the institutional and governance structures. The case study countries were selected to provide a range of cultural, geographical, institutional and administrative approaches, including countries that were at very different stages of implementing futures thinking. Detailed case studies were compiled and informed by interviews with senior officials in the respective member states. Following the production of individual country case study reports, SWOT analyses were undertaken for each country, providing the analytical framework for understanding which factors facilitated knowledge exchange from futures studies or research into practical policymaking in each country. These were then presented for each country as SWOT-tail diagrams. SWOT-tail© diagrams combine fishbone (Ishikawa) diagrams with SWOT analyses to provide a visual and concise summary analysis for each country. Clearly, there is no ‘one-sizefits-all’ solution; context and path dependency matter. The country case studies revealed very different histories of futures thinking across the countries studied. Taking the introduction of a central foresight body as an example, the analysis showed that some countries (e.g. Portugal, Sweden) had long-standing central foresight bodies (since 1950s/60s) while most countries have established such bodies only since the 1990s. Some countries did not have a central foresight body at the time of the study (i.e. Hungary and Slovenia). As noted, the country case studies analysed institutions, mechanisms and processes, and facilitated comparison between country approaches. This showed which approaches and structures were most and least common. A central foresight body, thematic studies and some use of scenarios in policymaking were all seen in 10 out of the 12 countries studied. However, less common were formalised foresight reporting requirements (5 countries), routine stakeholder involvement (5 countries) and horizon scanning formally in place (3 countries). Futures work and how it relates to environmental policy was classified by its ‘maturity’ into the categories mature, developing and nascent (see Figure 1). Futures work was considered most mature where it could mostly draw on permanent and formalised systems, diverse networks across levels of government and departments, and where experience of futures studies had a clear influence on policy. The category developing was applied where some features of futures work had been introduced and futures arrangements show evidence of lasting structures and influence. Futures work was considered nascent where futures arrangements were in their infancy, i.e. mainly ad hoc or fragmented, or where institutional structures or governance arrangements to facilitate futures thinking in policy at the level of national government has only recently been introduced. Parliamentary body/role of parliament: Some of the case studies, notably Finland, have shown that parliaments can play an important role in supporting futures thinking. Internal body: In most countries, some form of futures work is performed in government departments (whether regularly or ad hoc) although not all have a central body that coordinates or advises across all areas of government. External body: In the Netherlands and United Kingdom, no single centralised body deals with foresight. There are a number of external bodies/agencies that engage in futures work. In Slovenia, the Bled Strategic Forum, which works on long-term thinking at national and European levels, has sponsored debates about long-term futures, drawing thinkers from politics, industry and academia from all over Europe. Routine stakeholder involvement: The degree of consultation varies between countries, with Finland and Austria at one end of the scale with a high degree of participation and France on the other with comparatively little. Generally, the foresight topics are determined through consultations with expert stakeholders. Stakeholder participation is widespread among most futures programmes across the member states studied and driven by policy needs. Thematic or sectoral: Cross-sectoral studies appear to be more common in the environmental sphere, even in countries that undertake both types. Horizon-scanning system in place: Only a few countries have formally established horizon-scanning systems either centrally or within, for example, environmental agencies. Formally independent body/degree of independence: Trade-offs between access and independence are dealt with in different ways across countries. In most countries, this is somehow related to how the governmental institutions work. Permanent or ad hoc arrangements: In general, the most effective bodies for futures studies have had a permanent role and structure within government. Some countries have created ad hoc groups for specific studies. Governance culture and tradition of futures thinking: A long-standing tradition of futures thinking does not in itself facilitate the embedding of futures thinking in policymaking. Those with the most mature systems tended to have either a strong participatory, consensus-building governance culture (Finland, Sweden, the Netherlands) or a strong external advocacy tradition, as well as strong centralised government and policymaking (the United Kingdom). Interdisciplinarity and interdisciplinary approaches: The increasing importance of interdisciplinarity and interdisciplinary approaches can be observed among the many environment-related futures studies considered. Evidence versus strategy: It is apparent that in a few countries futures studies are used to develop or contribute to the evidence base upon which policies are built (and therefore often strongly associated with ‘science’ and science ministries), but they are also used to identify potential strategic priorities and ensure that the strategies developed have a view to the long term. The distinction between evidence and strategy is not absolute but, based on the individual country reports, it does appear that futures work is generally used for two sometimes distinct purposes: to inform strategic priorities or contribute to the evidence base upon which policies are built, using different methods. Political support and policy needs: A further element that can shape the approach to futures thinking is the specific need in the policy sector (Netherlands, Poland, United Kingdom, Germany) or influenced by work in other countries (France inspired by Finland, Hungary by the United Kingdom). In all four countries with nascent futures systems — Hungary, Poland, Slovenia and Spain — advanced technology foresight work in other countries has been prominent. Another important criterion for embedding futures work in policymaking is a government policy calling for the use of futures studies. Follow-up: The use of follow-up and feedback to futures studies seems to support the successful implementation of futures thinking in policymaking. Policy demand and political support would appear to be overwhelmingly the most significant factor. Need for policy-led futures thinking: policy interest and support may be key, and high-level ambassadors or ‘champions’ can help promote and influence the inclusion of futures studies in policymaking. High quality of studies helps to provide credibility and convince policymakers. Resources: skills and capacity are required for a successful forward-looking programme. Timeliness and relevance: to be taken up by policymakers, a futures study must be relevant to needs and available when needed. Stakeholder engagement and participation: broad participation is an important success factor as it increases legitimacy and helps establish familiarity and understanding. Potential role for parliament: Although parliamentary involvement is not necessarily a success factor, it may be important for facilitating democratic engagement in longterm environmental policymaking as well as a shift of futures work beyond a largely expert-driven process. · increasing participation, including the broad public: new technologies and innovative methods could be used to bring in a wider and more diverse range of opinions and ideas, as well as to disseminate study results and their implications. Download EPF Brief No. 241_Embedding Futures Thinking in Environmental Policymaking. EEA, 2009, Looking Back on Looking Forward: A Review of Evaluative Scenario Literature, EEA Technical Report No. 3/2009. The aim of the BMBF Foresight process that ran from 2007-2009 was to identify long-term priorities for German research and innovation policy with an emphasis on crosscutting systemic perspectives. The foresight process was meant to complement the German High-Tech Strategy, which had defined mission-oriented priority fields with a medium-term horizon. After the finalisation of the foresight process in 2009, an implementation phase with several interacting activities was launched in order to feed the results into other strategic processes. As a next step, BMBF set up an embedded, continuously learning foresight system with dedicated phases that will be repeated by all subsequent processes. Within this framework, the second foresight cycle was launched in early 2012. · explore in which areas strategic partnerships might be required. At this point in time, BMBF had not carried out any overarching foresight process since the FUTUR process (Giesecke 2005), which had been finalised in 2005. As some actors within BMBF had a rather critical view of FUTUR, an important additional objective of the new foresight process was to (re-)establish trust and confidence in foresight within the ministry. Accordingly, high emphasis was placed on communication within the ministry and early-on involvement of all BMBF departments that were potentially affected by the foresight outcomes. The foresight process was accompanied by a process and impact evaluation carried out by the Institut für Technologie und Arbeit (ITA). · expert interaction through interviews, workshops and a national online survey. In parallel, a monitoring panel composed of international top experts was interviewed twice in the course of the process. As requested by the ministry, the foresight process adopted a ‘technology push’ approach. In the first phase in particular, the process concentrated on identifying emerging technologies with long-term relevance to the German economy and society within the established realms of research and innovation. The criteria to assess ‘relevance’ were established in interaction with the ministry. In the second phase, the emphasis of the foresight process was placed on a second set of objectives: the identification of key issues emerging across these established technology fields. For this purpose, the results emerging from the technology push analysis were systematically reviewed and mirrored against major societal challenges such as sustainability and health. In this way, the seven ‘new future fields’ were developed as described in the previous brief. These fields are characterised by a highly dynamic development at the interface of emerging solutions and societal demand. departments particularly in the later phases of the process in order to validate and enrich the foresight findings. The first cycle of the BMBF Foresight process addressed two main user groups. First of all, the process sought to maximise its usefulness to the various departments within BMBF that are responsible for steering the BMBF support to research and innovation in their respective domains. The main benefits envisaged for the departments were the possibility to mirror their own perceptions against the foresight findings, gain an overview of each other’s activities, develop overarching perspectives, and identify potential linkages and possible blind spots. Secondly, the foresight was meant to serve the wider innovation system by providing long-term anticipatory intelligence for orienting strategy building within and among diverse organisations. The tangible output of the foresight process consisted of two core reports (Cuhls et al. 2009b and c). One report listed the selected themes with high long-term relevance in fourteen established research and innovation fields. The other report spelled out the seven crosscutting ‘new future fields’ and provided an analysis of key actors in the German innovation system as well as recommendations for policy action within these fields. The reports were first disseminated within the BMBF and later widely throughout the innovation system starting with a large public conference. Within the ministry, the uptake of the findings was actively supported through dedicated workshops where the project team members presented the findings and discussed the implications with the departments. In order to further facilitate the uptake, two follow-up projects were launched: The first was the ‘strategic dialogues’ where innovation system actors who had been identified in the foresight report jointly discussed options for implementing the findings. In one case (Production-Consumption 2.0), several other ministries, such as the ones dealing with the environment or food and agriculture, were involved in this debate. In a one-day workshop with more than 30 participants, diverse stakeholders debated the transdisciplinary research around the transition towards sustainable production and consumption that had been proposed by the foresight process. Secondly, the ‘monitoring system’ was set up in order to keep track of the evolution of the new future fields and inform the ministry in case further action was needed. process were taken up by subsequent BMBF funding initiatives. In the case of the ‘new future fields’, there was a general appreciation of the ‘bird’s eye view’ across established domains of ministerial activity that the process provided. Several attempts were made to take up the proposed perspectives. As the new fields did not match the existing organisational structures of BMBF, the implementation was not straightforward. This, however, was seen as an asset rather than a problem by the strategic department as the crosscutting perspectives were viewed as long-term guidance for strategic thinking within the ministry rather than an agenda for immediate implementation. environment, security and ICT. Finally, several of the core findings of the foresight process were fed into the strategic debate around the renewal of the High-Tech Strategy, which was taking place in parallel. In addition, several of the foresight’s suggestions entered the strategic debates in the wider German innovation system. The project team received numerous requests from the governments of the Länder (German states), research institutes and companies to discuss the implications of the ‘new future fields’ on their own strategies. Scan’, had defined some areas that were well in line with some of the ‘new future fields’, such as sustainable living spaces and human-technology cooperation. Nevertheless, the analysis suggested that there are no ‘onesize-fits-all’ systemic priorities as each cultural contextrequires its own specific framing of the issues at stake. Furthermore, the foresight process attracted considerable international attention, partly due to the fact that there had been substantial involvement of international experts through the monitoring panel and two conferences with international participation. After the process was finished, several countries around the world expressed their interest in both content and methodology. to their own rationale, created wide interest and debate (cf. e.g. Warnke 2010). As outlined above, paving the ground for embedding foresight into BMBF strategy building was an important objective of the process. The evaluation report confirmed the substantial progress made in this respect. Several actors in the ministry felt that they had benefitted from the foresight process and expressed their renewed openness and positive attitude towards foresight approaches. As a consequence of the perceived success of the first foresight process and in following up on the recommendations of the evaluation team, the ministry decided to establish foresight within the ministry as a continuous anticipatory learning process. For this purpose, a ‘foresight system’ was designed and implemented (BMBF 2012 c). This system cyclically evolves through the following phases: scanning, analysis, implementation and preparation of the next cycle. The previous foresight process was considered a pilot for the first cycle. Furthermore, it was decided that the second cycle should focus on the demand side of research and innovation and therefore primarily explore relevant societal changes that could then be linked to the technological trajectories suggested by the first cycle. innovation system has been set up to accompany the foresight process. From the beginning, the approach and findings are discussed with the BMBF departments on a regular basis. A separate EFP brief will be issued in order to describe this new process in detail. Download EFP Brief No. 240_BMBF Foresight. Cuhls, Kerstin; Ganz, Walter and Warnke, Philine (eds.) (2009c): Foresight-Prozess im Auftrag des BMBF. Etablierte Zukunftsfelder und ihre Zukunftsthemen, IRB Verlag, Karlsruhe/ Stuttgart. Giesecke, Susanne (2005) Futur – The German Research Dialogue. EFMN Foresight Brief No. 1. Warnke, Philine (2010): Foresight as tentative governance instrument-evidence from Germany. In: International Conference ‘Tentative Governance in Emerging Science and Technology – Actor Constellations, Institutional Arrangements & Strategies’, 28/29 October 2010, Conference Booklet, p. 113. STRATCLU, the ‘entrepreneurial’ strategy process of the German ‘spitzen’-cluster (leading-edge cluster) MicroTEC Südwest meets the needs of multi-actor, multi-governance-level and multi-sector research and innovation (R&I) policies. The forwardand outward-looking process exemplifies how a broad range of regional R&I actors can share and utilise strategic knowledge to identify joint priorities for longer-term, synergistic R&I investments and collective actions, and focus their diverse competences in microsystems as a general purpose technology to tackle societal challenges and enter future markets globally. In line with a more systemic understanding of research and innovation (R&I) policy (OECD 2005), the respective support programmes introduced the perspective of global, societal challenges to be tackled by scientific and technological breakthroughs. The German government, for instance, launched its High-Tech Strategy 2020 (HTS 2020) in 2006 with the aim to make Germany a leader when it comes to solving global challenges (climate/energy, health/nutrition, mobility, security, communication) and providing convincing answers to urgent questions of the 21st century. The German Strategy for Internationalisation of Science and Research stresses that, to realise optimised solutions to these challenges, it is necessary to leverage science and innovation potential worldwide. In the same vein, the Europe 2020 strategy and its flagship initiative “Innovation Union” aim at refocusing R&I policy on the challenges facing society, and the EU Cohesion Policy 2014-2020 asks the member states and regions to develop innovation strategies for smart specialisation. The ‘entrepreneurial process’ of developing regional innovation strategies for smart specialisation (RIS3) (Foray et al. 2009) focuses on unique regional assets with a view to developing competitive products and services in international markets. If the different RIS3 are developed in alignment with the European context, synergies can be leveraged to further develop the European Research Area. Against this backdrop, clusters as local nodes of global knowledge flows and ‘innovative hot-spots’ in globalised value chains provide the base not only for developing technological answers to the urgent problems of the 21st century but also for producing adequate, strategic knowledge for cutting-edge (and trans-regionally aligned) R&I programming (Sautter/Clar 2008). In 2007, the German government launched the ‘spitzen’-cluster competition as the flagship of the HTS 2020 and cornerstone of the national Strategy for the Internationalisation of Science and Research to support the development and implementation of future-oriented R&I strategies. The overall objective is to tackle key societal challenges and thus position the ‘spitzen’-clusters in the global knowledge economy and make them attractive for talented, creative people as well as innovative companies and forward-looking investors. MicroTEC Südwest in Germany’s south-western state of Baden-Württemberg and one of the winners of the competition started a forward-looking cluster strategy process inspired by the Strategic Research Agenda of the European Technology Platform on Smart Systems Integration (EPoSS), and focused on the priority fields of the German HTS 2020: climate/energy, health, mobility, security, communication. The MicroTEC Südwest cluster, closely linked withneighbouring parts of France and Switzerland, covers the competences needed along the value chain of the GPT (General Purpose Technology) miniaturised systems: from basic research, for instance in nano-, micro- or bio-technologies, to the design and production of smart microsystems, to the integration of such systems in ‘intelligent’ products (e.g. driver assistance systems in cars or point-of-care diagnostic systems in the healthcare sector). Besides global players like Bosch and Roche Diagnostics, the 350 actors involved in the cluster include top universities and research centres, and many small and medium-sized enterprises. 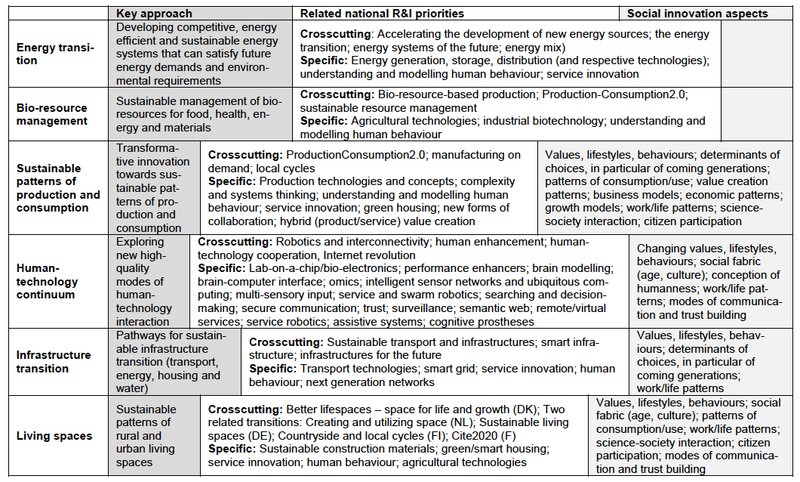 In order to focus the different competences on synergistic R&I investments, a ‘spitzen’-cluster proposal was developed with two application-oriented priorities to generate breakthrough innovations in global lead markets (health and mobility) and two technology-related priorities to develop and produce next generation microsystems for future fields of application. The funds (50-50 public-private) for implementation amount to nearly 90 million EUR, from national and regional ministries, regional bodies and enterprises. The MicroTEC Südwest proposal was highly evaluated in the competition not only for the quality of its research projects but also for its additional structural projects on innovation support, qualification and recruitment, internationalisation and the STRATCLU strategy process. · ensures long-term success in global competition. 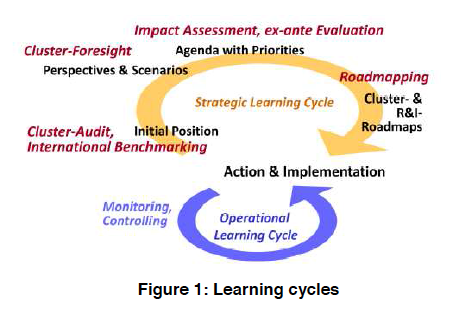 Related to the national priorities of the HTS 2020, and based on detailed science and market analyses, the investigation and discussion of global trends and an assessment of their specific impacts along the strategic learning cycle (fig. 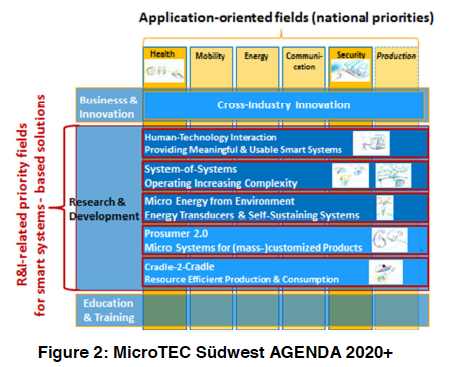 1), the MicroTEC Südwest strategy panel prioritised a joint AGENDA 2020+ with the following five major crosscutting priority fields for R&I, and an additional focus on cross-industry innovation and education and training. These five R&I-related priority fields for smart MSTbased solutions address and leverage synergies across all key application fields (in particular with regard to the national priorities of the HTS 2020). This topic was assessed as the most relevant. 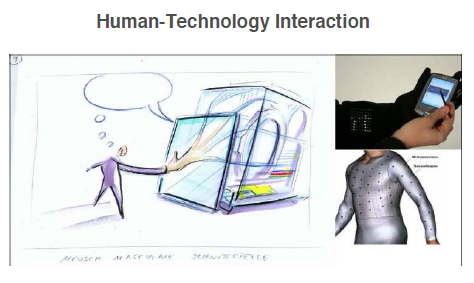 The renaming of the microsystems technology (MST) division of the German Ministry of Education & Research into Demographic Change: Human-Technology Interaction in the context of the German BMBF Foresight Process (Cuhls 2010) underlines the relevance of this issue. The big challenge is to develop smart MSTbased solutions adapted to people’s needs and providing them with real value added. Here, the focus is on the integration of smart systems in superior systems: from smart systems to smart things like cars to comprehensive systems such as the transportation system (cf. cyber-physical systems or Internet of Things). The big challenge is to handle the increasing complexity that comes with a higher degree of system integration. Energy converters (e.g. important for energy harvesting) and storage along with self-sustaining systems are preconditions to realise the systems-of-systems approach and to develop mobile and functional intelligent devices. In the future, the production of smart systems and things has to be closely related to mass-customisation in order to provide the users (consumers) with wellcustomised and cost-efficient solutions. Resource efficient production and consumption systems, total life cycle assessment (including the recycling stage) etc. are important issues in this priority field. Continuing along the strategy cycle, the AGENDA 2020+ provides the strategic framework for roadmapping exercises at multiple levels: Cluster actors develop R&I roadmaps towards market-focussed and MST-based breakthrough innovations to tackle societal challenges in prioritised joint action areas (e.g. in personalised medicine, factories of the future or green cars). These roadmaps will be aligned with other roadmaps, for instance of the European Technology Platforms EPoSS or MINAM, and integrated in the MicroTEC Südwest Cluster Roadmap 2020+, which involves also horizontal support measures like qualification, recruitment etc. and will be communicated to public and private investors (‘agenda setting’). Furthermore, the roadmaps will be transferred to SMEs in the cluster to support them in their own longer-term business development and R&I investment strategy. The participative forward- and outward-looking strategy process in the German ‘spitzen’-cluster MicroTEC Südwest shows successfully how regional R&I consortia can share and utilise strategic knowledge to identify joint priorities for longer-term, synergistic investments and collective actions. By enabling actors to systematically develop future strategies together, to asses them and develop actorspecific, synergistic approaches to successful implementation, the overall risk of longer-term R&I investments can be reduced significantly, for the current participants and for foreign direct investment. The strategy approach of MicroTEC Südwest meets the needs of (new) future-oriented, multi-actor, multigovernance level and multi-sector R&I policies in manifold ways. First, it focuses local competences in a general purpose technology on tackling grand societal challenges with the aim of entering global markets. Second, it strives to attract complementary competences and foreign direct investment from other regions, and to work together with strategic partners along global value chains. Third, it combines ‘bottom-up’ with ‘topdown’ activities by taking up and assessing external inputs from a regional perspective: for instance, the German High-Tech Strategy or the BMBF Foresights, European and other R&I policies and strategy processes, such as Joint Programming Initiatives or the Japanese NISTEP Delphis, respectively. Against this backdrop, the MicroTEC Südwest approach can be seen as a test bed for an ‘entrepreneurial process’ suggested by the European Commission to develop regional smart specialisation strategies and to capitalise on them to advance the European Research Area. To fully benefit from the regional assets across Europe, strategic capacity building has to be strengthened, not only in Europe’s world-class clusters. If more clusters such as MicroTEC Südwest develop and align their longer-term strategies in order to raise, structure and optimise overall private and public (EU, national, regional) investments, with one focus on pooling forces and jointly tackling common challenges, a big step could be taken towards smart, sustainable and inclusive growth. Download: EFP Brief No. 232_STRATCLU. Cuhls, K. (2010): The German BMBF Foresight Process, in European Foresight Platform, EFP Brief No. 174. Foray, D., David, P.A. and Hall, B. (2009): “Smart specialisation: the concept”, in Knowledge for Growth: Prospects for science, technology and innovation, Report, EUR 24047, European Union. OECD (2005): Governance of Innovation Systems: Volume 1: Synthesis Report, OECD Publishing. Sautter, B., Clar, G. (2008): Strategic Capacity Building in Clusters to Enhance Future-oriented Open Innovation Processes, in The European Foresight Monitoring Network, Foresight Brief No. 150. In January 2012, the Copenhagen Research Forum (CRF) gathered 80 European scientists to discuss the societal chal-lenges to be addressed by Horizon 2020, the next framework programme for European research and innovation, and consider how research could contribute the best solutions. This EFP brief explains the process behind the CRF and gives a summary of recommendations. It ends with a discussion on cross-disciplinarity and strategic partnerships as tools for organising research in order to solve complex societal challenges. The EU Commission’s proposal for a new framework programme, Horizon 2020, is devoted to strengthening the strategic organisation of European research and innovation. The ambition is to mobilise excellent scientists across various branches of knowledge in order to provide solutions for complex societal challenges. The Copenhagen Research Forum (CRF) set out to assemble a broad spectrum of leading European scientists to give their view on the Commission’s choice of societal challenges and possible ways of implementing Horizon 2020 as a means of tackling them. Approximately 600 scientists contributed throughout the process. The CRF recommendations clearly affirm the EU Commission’s selection of societal challenges as well as the idea of supporting cross-disciplinary collaboration as a means to address crosscutting problems within and across challenges. The recommendations also send a strong signal of support for a framework where excellence, cross-disciplinarity and simplicity in administrative processes are key components. The following pages provide an overview of the process behind the CRF, the main recommendations as well as a discussion of new instruments to be implemented to support cross-disciplinarity. The main idea behind CRF was to involve a broad spectrum of Europe’s top-level researchers in the making of Horizon 2020 since part of its preparation would take place during the Danish EU presidency in the first half of 2012. The University of Copenhagen, Technical University of Denmark and the Capital Region of Denmark wanted the scientific community to provide unbiased input to Horizon 2020, with the aim of making Horizon 2020 as attractive as possible to researchers working in the areas covered by the six societal challenges. Professor Liselotte Højgaard was appointed as Chair of CRF. The concept was finalised in the summer of 2011. The key issue was that CRF should convey ideas, visions and comments from outstanding researchers, all of whom were invited personally to join CRF. A full list of names of conference participants may be found in the CRF report (see link on the last page). Health: Professor Liselotte Højgaard MD, DMSc and Professor Deborah Smith. Food & Agriculture: Professor Peter Olesen and Director Kees de Gooijer. Energy: Dr. Jørgen Kjems and Professor Kjell Hugo Bendiksen. Transport: Head of Dept. Niels Buus Kristensen and Programme Director Dr. Christian Piehler. Climate & Resources: Professor Katherine Richardson and Professor Johan Rockström. Society: Professor Ole Wæver and Professor Loet Leydesdorff. The six panel chairships were asked to invite up to 100 researchers to offer their views in a virtual discussion forum. Out of the invitees, 15 researchers from each group were also asked to meet at a workshop conference in Copenhagen on 16 January 2012 shortly after the Danish EU presidency began. Virtual discussion forum – Divided equally between the six societal challenges, the 600 researchers were invited to comment on the draft text of Horizon 2020. The researchers were asked to contribute personal visions for the future as well as point out needs and possible solutions. They were also asked to suggest and comment on the technologies and the priorities within the given challenge as well as consider the instruments and implementation needed to ensure success as seen from a scientific perspective. Lastly, they were requested to contribute their ideas on how to secure the link between research and the innovation perspective stressed in Horizon 2020. All of the input was collected in a draft report that formed the basis of the aforementioned conference in Copenhagen. Conference – On 16 January 2012, the six panels met and discussed the draft report, offering comments and adding new ideas inspired by the input collected in the virtual discussion forum. The aim was to reach agreement on (1) the views and recommendations in each of the six panels, (2) a joint statement during plenary sessions expressing the view on scientific issues cutting across all six challenges and (3) recommendations for the implementation of a challenge-oriented framework as a basis for excellent research and far-reaching solutions. The Danish Minister of Science, Innovation and Higher Education, Morten Østergaard, attended the conference. Outcome – The conference resulted in a condensed report offering ideas and solutions that could help form Horizon 2020 from a scientific point of view. The conclusions were presented to the European community in an open dialogue as explained in the following. Dissemination – The CRF recommendations were presented to the EU Council of Ministers’ meeting in Copenhagen on 1 February 2012 and subsequently to the European Commission, the European Parliament as well as directly to Director General for DG Research and Innovation, Robert Jan Smits. The dissemination activities were closely connected to the Danish EU presidency. In the following section, we provide key statements from the CRF panels’ recommendations. A full version can be found in the report. Biomedical research and its implementation in clinical practice must be supported and accelerated. This requires a paradigm shift towards personalised medicine. The global revolution in biomedicine is providing new technologies. Utilising those technologies requires vast efforts to expand and implement them. A European platform engaging all key stakeholders to ensure discovery and delivery of these technologies will be crucial. Establishment of a European Strategic Action for Healthier Citizens is also recommended to assist in strategic long-term healthcare research and planning, including preventive measures and the spread of best practice across Europe. Overriding challenges of increasing demand, competition for land use and other resource scarcities create massive pressure to produce significantly more per unit of a given resource. Food, agriculture and land use must be seen in a complex and multi-directional value chain encompassing climate, available resources, environmental sustainability, transport, energy and health perspectives, not to mention social and economic requirements. Key objectives are reductions in food waste and water consumption, valorisation of all bio-resources, including municipal bio-waste and agro- and bio-industrial side streams as well as the recycling of sufficient amounts of carbon and phosphor to maintain soil vitality. Increasing prevalence of diet-related diseases and disorders calls for a balanced healthcare concept more geared towards prevention. There is a need to create a collaborative innovation culture linking researchers, companies (especially SMEs), university education, NGOs and governments. Horizon 2020 priorities should build on (1) a revised Strategic Energy Technology Plan (SET Plan), including a critical update of technology road maps and (2) a new, complementary systemic approach to combine technological, economical, political, social and cultural research to facilitate the transformation of the energy system as a whole. Collaboration of social sciences and humanities with ‘hard sciences’ must be recognised as necessary and organised and funded accordingly to meet the challenges at the system level. Coupling of educational efforts with research and innovation is critical for realising the ambitious plans for technology implementation and the overall system transition agenda. Direct mobilisation of universities in addressing systemic challenges should be given high priority. The complexity of transport challenges requires closer cooperation across scientific domains and integration across universities, research institutions and industry than in the past. Meeting the challenge of developing smart and green transport systems requires not only technological solutions but also a better understanding of transport behaviour and the use of innovative and effective policy instruments. This calls for a more pronounced role for the social sciences than in previous framework programmes as well as for strengthening the integration of scientific domains. Technological innovation will still be of paramount importance, including cleaner and safer vehicles for all transportation modes, cost-effective alternative fuels, advanced ICT for personalised real-time travel information with modal integration, metropolitan traffic management and smart payment systems. Climate change constitutes one of the most urgent global resource challenges facing society, where the resource in question is our atmosphere as a receptacle for greenhouse gas wastes. Development of actions and strategies for dealing with this challenge can potentially provide models for dealing with resource scarcity issues (biodiversity, ecosystem services, water, phosphorous, ores and metals etc.). A general paradigm for dealing with resource scarcity is reducing the need for – and more efficient use of – the resource, combined with the adaptation of human activities to changed conditions and/or the recognition of resource scarcity. In dealing with resource scarcity in general and the climate in particular, a major challenge is to channel the knowledge gained on the mechanisms of the Earth’s system into political and societal action. This requires cross-disciplinary approaches that integrate natural sciences with other disciplines. The focus of Horizon 2020 should thus be to underpin societal responses to climate challenges by including research on systemic interaction, collecting baseline information and establishing monitoring activities of different mitigation and adaptation approaches. The focus on ‘inclusive, innovative and secure societies’ provides a highly welcome challenge to the social sciences and humanities (SSH). The Horizon 2020 proposal tends to focus on ‘hard’ technologies, especially statistics, assessments and measures of efficiency (evidence-based lessons), with a corresponding tendency to employ a technocratic definition of the nature of the challenges (e.g. in the security part, critical infrastructure protection is prioritised over international politics). This represents a limited political and social vision that underestimates the power of citizens and communities to contribute to the realisation of inclusion, innovation and security. Corresponding to a vision comprising a broader mobilisation of societal energies are forms of research that employ a wider selection of methodologies and theories to study the dynamics of society as productive and generative, rather than as the site of problems to be solved. SSH can play key roles in the other societal challenges as well. It is important that researchers in the SSH engage scholars in the hard sciences in a joint effort to cultivate research-based innovation regarding the way expertise and democracy interact. The ambition of using societal challenges as a means to organise European research requires new approaches. The message from CRF is to pursue this through a combination of excellence, cross-disciplinarity and administrative simplicity. The CRF report signals a strong will among scientists to enter into cross-disciplinary collaborations in order to address complex challenges for which no single discipline has the solution. But this must not violate an equally strong need for administrative simplification and a continued effort to support excellence in all research activities. Without excellence as a fundamental requirement in all programmes, the cross-disciplinary ambition may become a hollow and strange add-on to ‘real’ science. Whenever a problem calls for a disciplinary approach, this should not be substituted with cross-disciplinarity. Timely application of new approaches must be a key priority. Strategic Partnerships as Tools for Organising Cross-disciplinary Collaboration? One of the ways in which cross-disciplinarity may enter the Horizon 2020 programme could be by establishing strategic partnerships devoted to delivering solutions to complex challenges. Strategic partnerships could be a way for the Horizon 2020 programme to nurture new constellations of fields of expertise without establishing very detailed road maps or other guidelines ‘from above’. It would be important to involve industrial and civil society actors in the formulation of strategic objectives in order to ensure that strategic partnerships become platforms for linking strategic priorities from science, policy, industry and other actors and that these partnerships organise collaboration accordingly. A key feature of implementing strategic partnerships should be to provide them with sufficient operational freedom so as to secure flexibility and entrepreneurship in how partnerships pursue their goals at the project level. Strategic partnerships should be an invitation and challenge to European research to explore new models of collaboration. This corresponds also with a clear recommendation from the CRF advocating the setup of strategic platforms connecting long-term visions with mid- and short-term investments in a dynamic way. The advantage of a partnership-based organisation of strategic research is that it allows coordinating a variety of fields and actors while creatively linking actors who would otherwise not establish collaborative ties. Coordination and connection are thus key aspects of well-functioning strategic partnerships – but only if the model builds on principles that afford strategic partnerships sufficient degrees of freedom in organising collaboration projects. Otherwise, the risk of reproducing fragmentation and the resulting problems known from FP7 cooperation will be substantial. The CRF epitomises an interest among scientists to engage in shaping the framework conditions of research and innovation. Beyond the scope of specific recommendations, the CRF may serve as a source of inspiration for how to establish a direct dialogue between the scientific community and policymakers. The CRF report was followed up by a ‘CRF II’ process during which the chairship of CRF put together a set of recommendations for the implementation of Horizon 2020 in light of the CRF report. The resulting paper (Højgaard, L. et al. [2012a]) focuses on recommendations for implementing measures to promote excellence, cross-disciplinarity, simplicity and impact. The recommendations for implementation along with the CRF report can be found at the CRF homepage (crf2012.org). Download: EFP Brief No. 228_Visions for Horizon 2020. 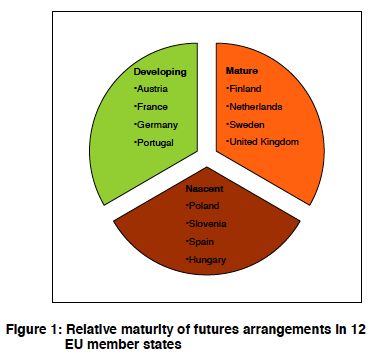 Højgaard, L. et al (2012): Visions for Horizon 2020 – from Copenhagen Research Forum. Højgaard, L. et al (2012a): Copenhagen Research Forum II. Recommendations for an optimized implementation of Horizon 2020. Both are available at www.crf2012.org. The aim of the European Environment Agency’s regular state of the environment and outlook reporting is to inform policymaking in Europe and beyond and help frame and implement policies. Information can also help citizens to better understand, care for and improve the environment. Global megatrends assessment complements the assessment of four European challenges (climate change, biodiversity loss, growing material use and concern for the environment, health and quality of life) while it identifies additional social, technological, economic, environmental and political factors beyond Europe’s control that are already affecting the European environment and are expected to continue to do so. An assessment of global megatrends relevant to the European environment has been performed for the 2010 European state and outlook report prepared by the European Environment Agency (EEA) and a network of countries (EIONET). It focuses on identifying the most relevant global pressures on Europe. A global-to-European perspective is relevant to European environmental policymaking because Europe’s environmental challenges and management options are being reshaped by global drivers such as demographics, technologies, trade patterns and consumption. While the future cannot be predicted with certainty, it also does not arise from nowhere. It is rooted in our present situation. Some trends visible today will extend over decades, changing slowly and exerting considerable force that will influence a wide array of areas, including social, technological, economic, environmental and political dimensions. While these megatrends cannot be predicted with certainty, they can be assessed in terms of plausible ‘what-if’ projections. Mega-trends always include uncertainties or strategic shock factors. They can lead to a sudden slowdown or change of direction. This concerns especially events with low probability but far-reaching implications (so-called ‘wild cards’). In addition, a combination of sub-trends can emerge into novel megatrends over a longer time frame, for example several decades. Many of these changes are interdependent and likely to unfold over decades. They can significantly affect Europe’s resilience in the long term. Naturally, such changes also offer unique opportunities for action. Effective measures, however, require better information and a better understanding of a highly complex and evolving situation. 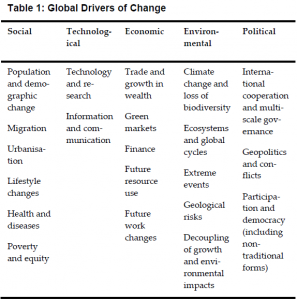 The assessment grouped a rich diversity of information on global drivers of change into a number of social, technological, economic, environmental and political (governance) megatrends (see Table 1). It summarised key developments succinctly with the goal of triggering a discussion about how we should monitor and assess future changes in order to better inform European environmental policymaking. A public call for evidence on global megatrends of relevance to Europe’s long-tem environmental The call was launched in June 2009 via the EEA website and was disseminated to relevant research networks and mailing lists. It generated a list of relevant studies that helped further prioritise topics for the analysis. The setting up of an external advisory group to guide the progress of the work. The group comprised representatives of international and national organisations in the field of environmental assessment as well as EEA’s scientific committee members. Reviews of academic and non-academic information sources in the form of eight targeted background reports produced between autumn 2009 and 2010. Consolidation of the information base following the STEEP (social, technological, economic, environmental and political) framework for classifying drivers of change. Structuring of the information base into information sheets including indicators. The complexity of interlinkages and manifold uncertainties inherent in megatrends require an exploratory, qualitative approach, underpinned by empirical data. It does not solely rely on quantitative modelling although already available model results are used in the analysis. Current approaches to risk analysis and quantitative forecasting are problematic since the systems at hand and their dynamics are not well understood, assumptions are often non-transparent and necessary data are not always available. The selection of the final list of global megatrends has been determined by matching selection criteria of relevance, novelty, data availability and feasibility within the time frame of the assessment. The analysis of global megatrends and their relevance to Europe’s long-term environmental context is being carried out as a longer-term and iterative process. The current report captures issues and results relevant to the context and timescale of the state and outlook report 2010. Further work will be undertaken during the next years – and this assessment process intends to provide a solid information base to support policy formulation with a long-term perspective. Eleven global megatrends were selected to address the European environmental challenges in the area of climate change, nature and biodiversity, natural resources and waste, and health and quality of life. The global population will continue to grow until the mid of the century but slower than in the past. People will live longer, be more educated and migrate more. Some populations will increase as others shrink. Migration is only one of the unpredictable factors for Europe and the world. An increasingly urban world will probably mean higher levels of consumption and greater affluence for many. Yet it also means greater poverty for the urban underprivileged. Poor urban living conditions with the environmental and heath risks this involves can easily spread to other parts of the world, including Europe. Risk of exposure to newly emerging and re-emerging diseases and new pandemics grows with increased mobility of people and goods, climate change and poverty. Aging Europeans could be vulnerable and at risk of being severely affected. The breakneck pace of technological change brings risks and opportunities. These include, in particular, the emerging clusters of nanotechnology, biotechnology and information and communication technology. Innovations offer immense opportunities for the environment – but can also create enormous problems if risks are not regulated adequately. High economic growth accelerates consumption and the use of resources, but it also creates economic dynamism that fuels technological innovation potentially offering new approaches for addressing environmental problems and increasing resource efficiency. One superpower no longer holds sway; regional power blocs are increasingly important, economically and diplomatically. As global interdependency and trade expands, so do international and bilateral agreements. Europe may benefit from this development by improving its resource efficiency and knowledge-based economy. How will Europe survive in the intensifying scramble for scarce resources? The answers may lie in more efficient production and use of resources, new technologies, innovation and increasing cooperation with foreign partners. A larger and richer global population with expanding consumption needs will place growing demands on natural systems for food, water and energy. Europe may see more pressure also on its own natural resources. Accelerating climate change impacts will imperil food and water supplies, impair human health and harm terrestrial and marine life. Europe may see also more human migration, changes in migratory species and heightened pressure on resources availability. The environment is burdened with an increasingly complex mix of pollutants that threaten the regulatory mechanisms of the earth. Particulates, nitrogen and ground-level ozone merit particular attention in view of their complex and potentially far-reaching effects on ecosystem functioning, climate regulation and human health. In addition, many other chemical substances are released into the environment, the effects of which – whether in isolation or combined – are still poorly understood. The world is finding new governance models – multi-lateral agreements and public-private ventures, for example. In the absence of international regulation, advanced European standards and procedures have often been adopted worldwide. But will this situation continue in the future? The analysis of global megatrends shows that they may have a series of direct and indirect consequences for Europe’s environment. These consequences can be illustrated by looking at the four priority areas that underpin the European Union’s Sixth Environmental Action Programme, namely climate change, natural environment, resource use, and environment and health. The most evident consequences are expected in the area of climate change. A whole set of global socio-economic megatrends will play a key role in determining the severity of climate change impacts in Europe in coming decades. Projected direct impacts in Europe include biodiversity change, particularly in the Arctic region, the Alpine region and the Mediterranean. Water scarcity can become a problem in southern European regions, whereas flooding threatens lowland coastal areas and river basins. Indirectly, Europe may experience increased migration pressures from developing countries, where accelerating global environmental change is becoming more important as a direct root source for migration, and its ageing population may become more vulnerable to extreme events such as heat waves. For biodiversity and nature, the global megatrends are expected to have a relatively weak direct impact on Europe itself (i.e. spread of invasive species), though globally the loss of biodiversity and indirect impacts on European biodiversity (through use of natural resources and pollution) will be a major concern. The links between global megatrends and their impacts on Europe’s natural resources are complex and uncertain. Europe is resource-poor in terms of fossil fuels (oil, gas) and minerals (e.g. rare earths, phosphorus, copper, aluminium) and will largely remain dependent on supply from abroad. For energy, Europe may turn to its own stocks (coal, oil shale, ‘revival of mining’), but exploitation costs will be high due to high costs of labour, environmental and occupational security, accessibility and landscape disruption. Changes in the abundance of migratory species and climate change impacts might be aggravated by an increased demand for and depletion of domestic resources (such as food and timber). Similarly, heightened global demand for European agricultural and forestry products may lead to an increase in the intensity and scale of agriculture and forestry in Europe, increasing pressure on water and soil resources. Technology, however, may act to reduce pressure on Europe’s natural resources by enhancing the efficiency of resource use and improving agricultural yields. In addition to the direct and indirect consequences on Europe’s environment, the megatrends can be expected to also have a global impact on environmental security in many parts of the world, including Europe’s neighbours in the southern and eastern Mediterranean as well as in Sub-Saharan Africa. Examples of such impacts are climate-change-induced refugees, risk of new pandemics and new diseases, conflicts arising from competition for resources, development problems related to uncontrolled urban sprawl. How Can We Respond to Global Megatrends? The assessment of megatrends highlights a range of interlinkages and interdependencies. They increase complexity, uncertainty and risk and accelerate feedback within and between economic, social, technological and environmental systems. The growing global links also offer unique opportunities for action although the attempts to realise these opportunities face the challenge of huge time lags between action (or inaction) and effect. Responding to global megatrends and reflecting future changes in policy is thus a challenging task. The report of the Reflection Group on the Future of Europe has emphasised how many recent global developments, such as the financial crisis or price volatilities in key commodity markets, have caught us by surprise. A key question emerges: how can we respond to global challenges in resource-using systems when we are very far from understanding them completely? For example, much of the speed and scope of global environmental change has been underestimated by scientific assessments and policy appraisals. Few considered that some of the key emerging economies would develop so fast and affect global demand as quickly as they have in the last decade. reflecting on further policy changes to take better account of global-to-European interlinkages and better align European external policies with environmental policies. Download: EFP Brief No. 227_Assessment of Global Megatrends. EEA, 2010a, ‘General support to framing the forward-looking assessment component of the European state of the environment and outlook report 2010 part A — Background Paper on Demographics and Migration’, European Environment Agency, Contract Number 3403/ B2009/EEA.53788 (unpublished). EEA, 2010b, ‘Background paper on urbanisation and consumption— General support to the forward-looking assessment component of the 2010 European State of the Environment and Outlook Report (Part A)’, European Environment Agency, Copenhagen (unpublished). EEA, 2010c, ‘Report on health related megatrends — Identifying global health megatrends in support of SOER 2010 Part A’, European Environment Agency Contract No. EEA/AIR/04/007 Specific Agreement 3403/B2009/ EEA.53683, Task 4. EEA, 2010d, ‘Global megatrends in the area of nano-, bio-, ICT and cognitive sciences and technologies’, European Environment Agency, Copenhagen (unpublished). EEA, 2010e, Pharmaceuticals in the environment, EEA Technical report No 1/2010, European Environment Agency (http://www.eea.europa. eu/publications/pharmaceuticals-in-the-environment-result-of-an-eea-workshop/at_download/file) accessed 23 November 2010. EEA, 2010f, The European environment – state and outlook 2010: synthesis, European Environment Agency, Copenhagen. This brief synthesises the findings of forward-looking activities that were recently carried out in different European countries with a focus on research and innovation. In order to structure the activities’ outcomes, a framework is used that distinguishes different types of outcomes. The findings of the activities are then presented along this framework. The last section suggests some conclusions for European-level, challenge-driven research and innovation priority setting. The study was conducted for the expert group Global Europe 2030-2050 http://ec.europa.eu/research/social-sciences/fwl-experts-groups_en.html and financed by the European Commission’s Social Science & Humanities Programme. The countries in focus were France, UK, Germany, Spain, Poland, Finland, Ireland, Luxemburg, the Netherlands and the region of Flanders. All nine activities adopted forward-looking methods for a structured assessment of possible pathways for research and innovation. All activities were based on intense involvement of experts and stakeholders with diverse backgrounds. Some adopted very large-scale participation and reached out to broad publics (FORSK2015, NL Horizon Scan); others were more confined to core actors with specific expertise (UK TIF, T&I Flanders, BMBF Foresight). Moreover, some of the activities aimed at generating possible pathways of change within a certain time horizon or even pursued fully fledged country scenarios, as in the case of Poland and Ireland. 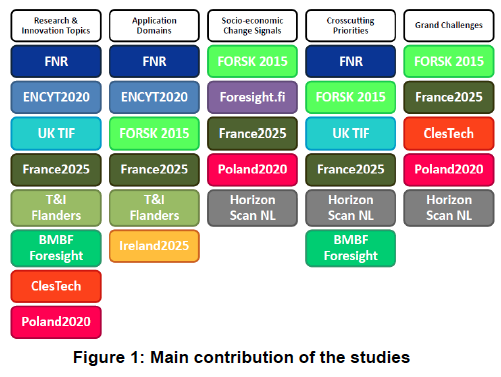 Others were more interested in scanning signals pointing towards relevant changes (Foresight.fi, NL Horizon Scan), and again others sought to collect and assess a wide range of proposals for research and innovation (R&I) topics (FORSK2015, FNR, ClésTech). While some of the activities focused on assessing technological trends (ENCYT2020, T&I Flanders, ClésTech) others adopted a very broad perspective on up-coming socio-economic change and its consequences for research and innovation (France 2025, Poland2020). Other activities put particular emphasis on linking established realms of research and innovation, on the one hand, and areas of need and problems in new future-oriented ways (BMBF-Foresight, NL Horizon Scan). With this rich diversity of approaches, all selected activities have one ultimate goal in common: defining a research and innovation agenda that best addresses future needs. Most of the activities used a set of criteria for assessing RTI topics composed of global challenges, on the one hand, and national objectives, on the other. Thus, the synthesis may well provide valuable insights on the challenges ahead when orienting research and innovation towards the grand societal challenges of our times, as envisaged in the European Innovation Union Initiative. Research and innovation topics: Specific topics for research and innovation assessed as highly future relevant and therefore to be prioritised. Due to the nature of the activities, these topics usually stem from engineering and natural science realms. Example: Metamaterials (UK TIF). Application domains: Domains and sectors where significant applications of the technology and innovation areas are expected. Example: Transport (ENCYT, UK TIF). Some activities contribute in depth to one of the categories; others address two or more aspects as illustrated in Figure 1. Despite national specificities and differences among the countries, a certain convergence of R&I priorities can be observed. Topics related to energy transition as well as sustainable patterns of production and consumption are high on the agenda of several countries followed by health related topics and information and communication technologies. A number of the activities emphasise socio-economic change as a key element of the innovation arenas. In particular, several activities point out the need to explore new forms of identity-forming, cultural diversification and community building to understand successful innovation pathways. The Foresight.fi blog specifically considers changes in socio-economic patterns as a core part of research and innovation futures. Issues such as changing attitudes towards product ownership, identity formation, self-expression, changing innovation patterns, new concepts of work, new types of jobs, new work and communication attitudes, open data, open science, new growth models, information owner-ship/control are discussed at some length and seen as relevant drivers not only for society overall but also for the direction of technological innovation. Another study that considers socio-economic innovation in depth is the NL Horizon scan. Some of the proposed priority topics explicitly address socio-cultural research, focusing for example on the socio-cultural meaning of an aging population. Another cluster is dedicated to new forms of work and education. Two other topics deal with global political and economic changes. The UK TIF study deals in depth with intellectual property rights as an area of innovation in its own right. The domains where the innovations are expected to be applied are similar in all activities. Across activities, there is a striking emphasis on food and agriculture, both in terms of security and safety and as a key aspect of environmental sustainability and culture. The other two top innovation target areas are energy and transport followed by health, housing, communication, education, public administration and security. Some national differences can be clearly identified. France, for instance, is putting strong emphasis on agriculture whereas Luxembourg is focusing on multimedia and service innovation. Germany is innovating along traditional production paradigms whereas the UK is pushing innovative manufacturing technologies in combination with new service and business concepts. Finland is especially concerned with the future of the countryside. Most of the activities did not explicitly attempt to define the grand challenges driving research and innovation activities but rather adopted them from well-known documents such as the Millennium goals. In one case (Ireland), competitiveness of national industry was used as the only relevant criterion, but also several other national activities chose technology and innovation areas with a strong emphasis on securing advantages over competing economies. However, most activities saw the need to address global challenges as an important rationale for RTI priority setting and adopted a mix of selection criteria combining competitiveness and challenge-oriented criteria. None of the activities highlights one particular technology area as likely to yield radical breakthrough innovations in the near or mid-term future. However, most activities aim towards breakthrough transformations in key innovation arenas through alignment of innovations from technological and socio-economic realms in order to achieve change in addressing societal challenges. By definition, such transformative priorities require research across engineering, natural and social sciences as well as the humanities, as they target aligned social and technological breakthrough innovation rather than just isolated technological change. The synthesis offered here focuses on the most striking convergences within the national foresight activities. Accordingly, the transformative priority arenas outlined below are far from covering all relevant topics for research and innovation identified by the activities. The transformative priorities emerging from the national forward-looking activities outlined in the previous section directly link with the “grand societal challenges” addressed in the Lund declaration and the Innovation Union initiative. Moreover, they are perfectly in line with the Innovation Partnerships proposed by the Innovation Union Flagship, both in terms of set-up and content. In particular, the areas Smart Cities and Smart Mobility as well as Agricultural Sustainability outlined by the Commission Communication fit well into the framework presented in this paper. But also the challenge-driven approach, the strong role of social innovation and the need to go beyond the “technology focus of the existing instruments” fit with the Innovation Union approach. Several of the societal challenges are closely interlinked. It is obvious that the evolution of living spaces is closely tied to the underlying infrastructures and energy sources, which again co-evolve with the patterns of production and consumption. Therefore, the transition arenas cannot be easily separated. Optimising one aspect without taking into account the other is bound to fail, as several activities point out using the example of potential conflicts of biodiversity and bio-resource use. Although several activities converge around certain socio-technical breakthrough arenas, the meaning is still different in each cultural context. This is obvious in the case of the living spaces of the future. Even though some countries have proposed almost identical priorities, the main concerns behind these propositions differ: The Fins are very much concerned with life in the countryside as a key element of their culture; the Dutch in turn expect to free space by changes in agricultural use and think of new possibilities for making good use of scarce space; the French focus is on the future of agriculture and food quality whereas the Germans, with their recent experience of shrinking cities in Eastern Germany, are considering flexible spaces to adapt to changing life-styles. Similar observations hold for all other transition arenas. Accordingly, when acting at the European level, “normalising” national diversity into one-size-fits-all approaches is bound to fail. The rich diversity needs to be kept as a particular strength. Transformative breakthrough priorities, as suggested here, are not a purely a matter of science and technology but involve substantial social and cultural innovation. Accordingly, they cannot be addressed through research alone but require aligned social and technological experimentation. This again cannot be enforced by top-down priority setting in the realm of science and technology. Participatory processes involving not only researchers and engineers but also European citizens are needed to define the adequate designs for these experimental spaces. The activities investigated here give some indications how this could be done, also at the European level. In particular, the Netherlands Horizon Scan and the Danish Forsk2025 seem to offer feasible routes for orienting research and innovation in society and technology towards shared goals by a creative and participatory linking of problems and solutions. This foresight exercise was conducted as part of the CROSSROAD Project – A Participative Roadmap for ICT Research on Electronic Governance and Policy Modelling, a FP7 Support Action that aimed to provide strategic direction, define a shared vision, and inspire collaborative, interdisciplinary and multi-stakeholder research in the domain. This research set out to help policy makers implement the Digital Agenda for Europe, the flagship initiative of the EU 2020 strategy launched to increase EU growth and competitiveness in the fast-evolving global landscape and address the grand challenges our world is confronted with today. the policy modelling domain, which includes forecasting, agent-based modelling, simulation and visualisation. These ICT tools for governance and policy modelling aim to improve public decision-making in a complex age, enable policy-making and governance to become more effective and more intelligent, and accelerate the learning path embedded in the overall policy cycle. In 2010, the European Commission funded the support action: CROSSROAD – A Participative Roadmap for ICT Research on Electronic Governance and Policy Modelling (www.crossroad-eu.net) in order to advance the identification of emerging technologies, new governance models and novel application scenarios in the field of governance and policy modelling. The main goal of the CROSSROAD project was to design the Future Research Roadmap for this domain and to structure a research agenda, which could be fully embraced by the research and practice communities. Overall, the research roadmap aims to push the boundaries of traditional e-government research to new limits and help resolve the complex societal challenges Europe is facing by applying ICT-enabled innovations and collaborative policy modelling approaches, which include the harnessing of collective intelligence, agent-based modelling, visual analytics and simulation, just to mention a few. In this context, a foresight exercise was conducted to look at the future of ICT-enabled governance and develop a vision of the role of ICT research in shaping a digital European society in 2030 through four thought-provoking visionary scenarios. The scenario design developed aimed to provide a structured framework for analysis of current and future challenges related to research on ICT tools for governance and policy modelling techniques. The scenario framework proposed was chosen to stimulate further debate and reflection on possible, radical alternative scenarios. It takes today’s world and constructs images of possible future worlds, highlighting ways in which key uncertainties could develop. The aim is to present clues and key impact dimensions, thus increasing the ability to foresee possible development paths for the application of ICT tools for governance and policy modelling techniques. Thus risks can be anticipated and better preparation can be made to take advantage of future opportunities. In turn, this outlines key elements to be taken into consideration for the further roadmapping and impact assessment of future research in this domain. Instead of attempting to forecast possible future ICT-enabled scenarios, four internally consistent – but radical – views were defined of what the future European Information Society might look like in 2030. These give four distinctly different visions of what Europe’s governance and policy making system could be and what the implications of each could be for citizens, business and public services. Following the mapping and analysis of the state of the art in research themes related to ICT for governance, policy modelling and the identification of emerging trends, the main impacts on future research in this area were defined. They were further refined through an analysis of existing scenario exercises and the current shaping of policies and strategies for the development of the European Information Society. The uncertainties underlying the scenario design were: 1) the nature of the dominant societal value system (more inclusive, open and transparent or exclusive, fractured and restrictive), and 2) what the response (partial or complete, proactive or reactive) could be to the acquisition and integration of policy intelligence techniques in support of data processing, modelling, visualisation and simulation for evidence-based policy making. Accordingly, the key impact dimensions were classified on two axes: degree of openness and transparency (axis y) and degree of integration in policy intelligence (axis x). The axes represent ways in which social and policy trends could develop. Based on these dimensions, scenarios were then developed in a narrative manner as descriptions of possible outcomes in selected key areas, representative of the European context, where emerging trends related to the development of ICT tools for governance and policy modelling techniques could have an impact. The vertical axis indicates the degree of openness and transparency in a society in terms of democratic and collaborative governance, which could be further enabled by ICTs. The most open and transparent society would be one where even traditional state functions are completely replaced by non-state actors through opening-up and linking public sector information for re-use. Such a society would be characterised by open standards and principles of transparency and accountability in governance and public management. An important aspect of this scenario would be the regulatory and technological solutions and also the socio-cultural attitudes to the basic digital rights underpinning the future Information Society. In fact, the concept of openness is not strictly related to technological solutions but rather to socio-cultural and organisational aspects that can be enabled and supported by technological advancement. The horizontal axis shows the degree of integration of data and knowledge and the mode of enabling collaboration between all stakeholders in policy design and decision-making. This involves the possibility – enabled by ICTs – to mash up data and information available from different sources in an ‘intelligent way’, meaning in a way that is efficient, effective and suitable to generate public value. It also involves the extent to which users, individually or as members of formal and informal social networks, can contribute to the co-design of policies, simulating and visualising the effects of legal and policy decisions, and engage in real-time monitoring and prior assessment of possible expected impacts at local, regional, national and pan-European levels. This horizontal axis is also associated with the capacity and willingness of policy actors to share power and change decision-making mechanisms in order to facilitate the redefinition of basic democratic freedoms in a collaborative fashion. This could go to the extreme of redesigning the traditional mission of the state and the role played by governance stakeholders. Again, ICTs are not the driving force; rather change is driven by changes in social values, attitudes and new paradigm shifts in terms of information management, knowledge sharing and the allocation of resources. In the Open Governance Scenario, users will enjoy unprecedented access to information and knowledge. By shifting cognitive capacities to machines, humans will be freed from the work of memorising and processing data and information and will be able to focus on critical thinking and developing new analytical skills. This will enhance collective intelligence (both human and ICT-enabled). Humans will be able to use policy modelling techniques to help solve global challenges. Possibilities for the provision of personalised and real-time public services will be opened up. The online engagement of citizens and various governance stakeholders will increase. Citizens, businesses and researchers will have direct access to data they need, and this will create new opportunities for people to interact with and influence governance and policy-making processes and help to make progress in solving societal problems. Governance processes and policy-making mechanisms will be based on intelligent, ICT-enabled simulation and visualisation systems, which will be able to find meaning in confusion and solve novel problems independently of human-acquired knowledge. New, open ways of producing and sharing knowledge will radically change traditional governance and decision-making. This will herald an era of open innovation, with unimagined opportunities for research and technological development. Public, private and third sector institutions will start to listen more carefully to their stakeholders, and a sort of ‘molecular democracy’ will arise. The Leviathan Governance Scenario assumes that an ‘enlightened oligarchy’ will emerge that uses high-tech tools and systems to collect and manage public information and services. Judgement and decision-making will be based on analytical processing of factual information from the many by the few for the benefit of all. Full-scale automatic simulations and policy intelligence tools will facilitate decision-making and the oligarchs will simply approve the recommendations of these tools for the best policy option for the majority of citizens. ‘Real-time governance’ will be possible where the government/citizen relationship is under total control. Public service delivery will be personalised without people having to ask, thus saving a great deal of time. Citizens will trust the government and will be willing to delegate their right of initiative. They will be persuaded to be happy with this situation, as no human-caused problems will exist; emotions and thoughts will be controlled and directed towards the public good. Citizens’ choices will be restricted by predefined and pre-calculated algorithms that optimise people’s performance. However, information overload or potential failure of information systems to respond to critical, unforeseen situations would result in chaos, with humans and devices not knowing how to respond. In the Privatised Governance Scenario, society will be shaped by decisions taken by corporate business representatives. Discussion on social issues and about the role and behaviour of citizens will be muted, as people will be pawns whose needs and desires will be managed by large corporations. Interactive and participatory governance mechanisms will be sidelined, along with democracy as we know it today. Simulations based on data gathered by sensors and collected from continuously monitoring and analysing networks, businesses, customers and the environment will produce global information that will nonetheless be fragmented and owned by corporations. Systems will be threatened by frequent attacks from independent groups and dissident communities. The media will be owned by the large corporations and will generally support them. Misinformation and jamming campaigns will be launched, making it necessary to verify all information and data. In this scenario, there will be opportunities for high innovation and development due to the pressure of competition on a free market. However, such opportunities will be useful only for the limited number of users able to afford them. Risks will arise due to private interests and fragmentation of the public good, leading to a ‘fragmented society’ where social welfare services will not be guaranteed to all, thus exacerbating possible social tensions and conflicts. The Self-service Governance Scenario envisages a society where citizens will be empowered to play the role of policy makers. In small expert communities, citizens will devise policies according to the do-it-yourself principle; they will choose from a menu of public services those they need and consent to. This ICT-enabled, self-organised society will be able to address emerging problems faster than traditional government could. Its creative, contextual solutions could prove to be more robust and resilient in a crisis. Nevertheless, the diversity of opinions between discrete communities may result in the deepening of existing divides and a lack of social cohesion. Insularity will afflict minorities most severely, as they lack local social networks and may run into communication problems due to language and cultural differences. However, thanks to efficient translation tools, the dissipative communities may, in the end, create a vibrant cross-cultural and multi-language society. The difference between success and failure will be marked by the distinction between creative group thinking and ‘crowd stupidity’. The process of the gradual disappearance of institutions and lack of trust in government will result in the need for new trust providers. Reputation management, for content and people, will play a significant role in service provision. As the majority of citizens will not be interested in participating in governance due to the lack of engagement culture, new Caesars may emerge who unify disparate groups but damage the subtle equilibrium between self-serving and collaborative cultures. In all the scenarios developed, the world in 2030 is expected to be radically different from today’s due to the unprecedented growth and speed of ICT uptake in several fields and the related impact ICT tools that enable governance and policy modelling techniques may have. The influences and drivers of innovation and renewal in the public sector, combined with increased financial pressure on states, will result not only in change, but will also affect the pace at which the state adapts to the new environment, to its new roles and to increased engagement with stakeholders and users. Whichever scenario dominates in the future, conventional wisdom and familiar governance models will be challenged in the coming years as ICT-based disruptions impinge on democratic, consultative and policy-making processes. There is already evidence that the scope and scale of the transformations to come will have a major impact on society. Since 2005, there has been a phenomenal growth in mass on-line collaborative applications, which has captured the imagination and creative potential of millions of participants – particularly the younger generations. In addition to new forms of leisure pursuits, community-building activities have also entered the political arena. Hence, these tools herald the transition to a different form of dynamically participative governance models. While such scenarios are readily imaginable, it is recognised that we currently do not have appropriate governance models, process flows or analytical tools with which to properly understand, interpret, visualise and harness the forces that could be unleashed. Present governance processes provide laws and regulations, interpret and define societal norms and deliver societal support services. Their legitimacy is derived through democratic processes combined with a requirement for transparency and accountability. In a world that is increasingly using non-physical communication and borderless interaction, the traditional roles and responsibilities of public administrations will be subject to considerable change, and classical boundaries between citizens and their governments will become increasingly blurred. The balance of power between governments, societal actors and the population will have to adapt to these challenging new possibilities. The scenarios developed as part of CROSSROAD served as an input to be compared with the integrated analysis of the state of the art in the domain of ICT for governance and policy modelling. Based on this comparison, a gap analysis was conducted to identify an exhaustive list of specific gaps where on-going research activities will not meet the long-term needs outlined by the future scenarios. Through a participatory foresight process it was possible to bring together not only experts and interested parties from academia and research, industry and government, but also to involve directly policy-makers and other interested stakeholders. This exercise resulted in a substantial contribution to shaping the roadmapping of future research in the domain, thus proving to be useful and needed. Altogether, and due to the increasing demand for openness, transparency and collaboration that address broad governance and policy-making challenges, the scenarios identify the need for developing and applying ICT tools and applications that fully exploit the potential of mass collaboration and the open and participatory paradigm underpinning future technological developments and policy directions in Europe. Research and innovation investment in this domain could create value for the EU community and avoid fragmentation of research efforts. It will require the development of a joint strategic research agenda on ICT for governance and policy modelling to support the building of an open, innovative and inclusive Digital Europe 2030. Innovation, sustainability, economic recovery and growth will in fact depend more and more on the ability of policy makers to envision clearly and effectively both the root causes and the possible solutions to complex, globalised issues.